Let our professional team handle any faucet repair you need done! 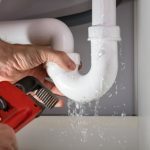 When it comes to plumbing repair in Southport, North Carolina, there are some simple jobs that any homeowner could likely complete on their own. However, there are many instances where you may want to work with a professional plumber to ensure you get quality services. If you are in need of faucet repair, our team at Benjamin Franklin Plumbing, Inc.-Leland will take care of the repair as efficiently as possible. Your faucets are used on a daily basis, so it can be very inconvenient to suddenly have a faucet not functioning properly. The faster you get in touch with our professional plumbers, the faster we will be able to complete your faucet repair. We don’t want you to have to deal with something as inconvenient as a broken faucet, which is why we are punctual and efficient with all repairs. When you need faucet repair done, you can also trust our team at Benjamin Franklin Plumbing, Inc.-Leland to provide not only quality faucet repair and other plumbing services but exceptional customer service as well. We have been serving the Southport area since 1999, and we are dedicated to our customers no matter what plumbing help they need. We believe our customers deserve the best services, whether you need faucet repair or something more serious. Let our professional team at Benjamin Franklin Plumbing, Inc.-Leland handle any faucet repair you need done. You can count on us for efficient, honest work from a reliable team. Give us a call today!